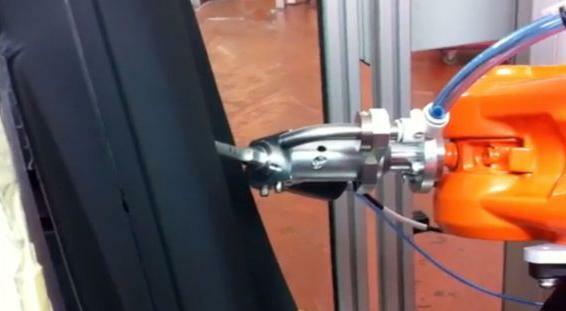 There are a number of techniques and processes capable of performing this task, however machine builder and system integrator TEC Systems Limited chose Telsonics’ ultrasonic technology to provide a clean, cost effective and environmentally friendly solution, within a multi-robot cell used to produce door cap components for Jaguar cars. 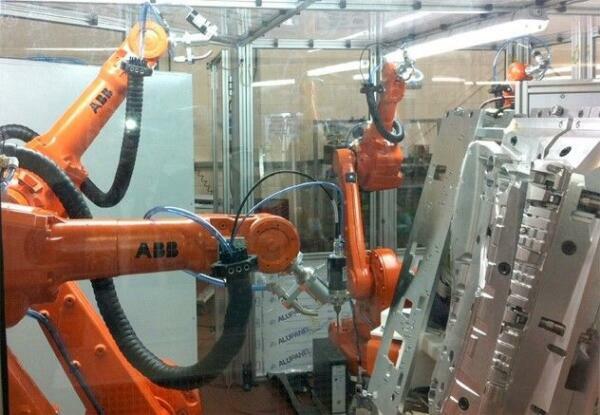 The production cell comprises of four ABB robots, and each has a Telsonic ultrasonic knife mounted to the robot wrist. The robots work in combination with a rotary indexing system, which incorporates precision fixturing, and presents the component parts for processing. The system produces the front, rear, left and right-hand parts for the new Jaguar XE model. Telsonics’ ultrasonic technology was chosen for this application for a number of reasons including the high quality edge finish achieved from the process and the cutting speed achievable. The slim profile of the ultrasonic knife also enables easy access to the areas of the component that would be difficult to reach with alternative cutting technologies. The Ultrasonic process is also much quieter and cleaner than a Water Jet system and there are no issues with fume extraction, which is a requirement when using lasers to cut materials of this type. The compact nature of the ultrasonic knife compliments the dexterity of the robot allowing maximum flexibility within the system parameters. Each of the robots uses a 35kHz SG3510V Telsonic generator with a SE3512 converter and hardened steel knife. Chilled air-cooling aids optimum cutting speeds and also allows the system to maintain the high duty cycles required within the automotive sector. Telsonic ultrasonic modules and systems offer unprecedented levels of choice for end users, machine builders and system integrators. The company’s range of ultrasonic modules are also designed to be “automation friendly” allowing easy integration within stand alone systems and sophisticated production lines.